I need to go on a Pinterest diet. I need to de clutter my pins and organize my boards. I need to NOT pin anything new until I’ve actually tried something else that I’ve pinned. It sounds good anyway. In the mean time I will occasionally blog about my Pinterest successes and failures. 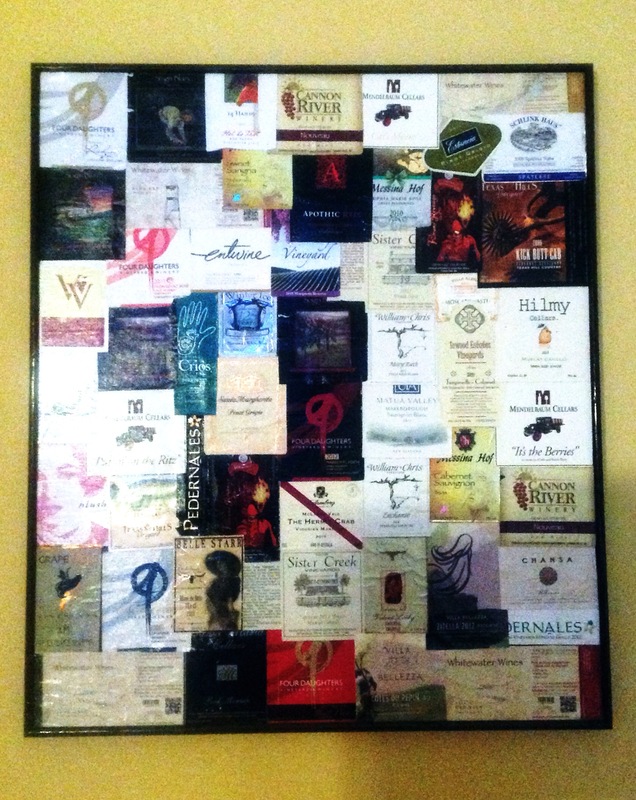 A couple of years ago I stumbled across this idea for a wine label collage. My husband and I drink a lot of wine and we enjoy the discovery of local, unique wineries and wines. Many of our favorite wines are from Minnesota and Texas. So, I started collecting labels off of our wine bottles. I have a better picture of it somewhere but I can’t find it. I had a blast putting it together. I used my electric tea kettle to boil water and poured the water directly into the empty wine bottle. Then I peeled the label off and stuck it to plain white paper and stored them in a folder until I had enough. Occasionally there were labels that just did not come off, but most of them did. Then I arranged them on my canvas and mod podged them in place. I’m about ready to make my second collage! Although have you seen the hilarious website about “EpicFail” of Pinterest projects? So, so funny especially the various food projects.